John 21 and Luke 24- Emmaus? Does the bodily resurrection matter to daily life today? What does it mean to proclaim something in Jesus’ name (v.47)? What is the nature of this risen Jesus? Two actions reveal that Jesus is real. This is no figment of imagination or ghost. This story must be seen alongside the Emmaus story, where Jesus is unrecognizable, but mysteriously both vanishes and is recognized at the breaking of the bread. Mission of the disciples is to preach the good news of repentance and resurrection. This “is a narrative that addresses theological questions that thoughtful people often ask when the chords of the “Hallelujah Chorus” have faded. What was the risen Jesus like? What is the meaning of resurrection? How is this Jesus present now?” (Charles Cousar, Texts for Preaching, p. 294) These are questions that the preacher must consider in preparation, and perhaps even ask in the midst of the sermon, but need not necessarily answer. Jesus understands the disciples fear and concern. He meets them there and invites them to move through their fear by touching, tasting and seeing. How might we also meet people in their anxiety and invite them through it? When we encounter fear and skepticism- how we respond? With “peace”? What does an Easter community look like? 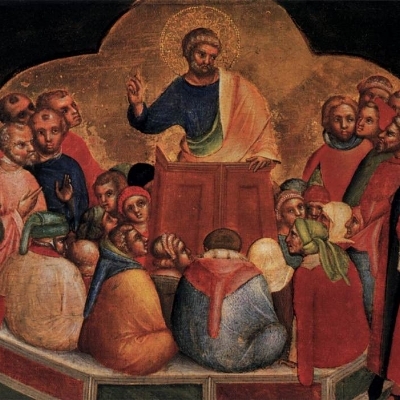 Lectionary bounces through Acts, tiptoeing so as not to upset the Pentecost experience that is coming. Next week goes to another Peter speech about Jesus. This passage is the middle of a scene in which Peter and John heal a man crippled since birth. Peter is speaking to the people who gathered after seeing Peter heal the man. “His name itself has made this man strong,” Peter proclaims. By what authority do churches serve? Eternal God → Jesus of Nazareth → Resurrection → Transformation here and now. What does the Easter church look like? How are we changed to be a community proclaiming the good news of Jesus Christ? Are we trying to do it alone or are we working with others in our community? Are we celebrating all the things we have done or are we celebrating what God is doing through us? Are all of our actions (both internal and external) a proclamation of the radical invitation to grace as exemplified in the life, death and resurrection of Jesus Christ? Opening words from the United Methodist Book of Worship liturgy for a Service of Death and Resurrection, p. 141. No surprise that these words would be used as words of hope in a time of mourning, but in a way, using this reading at a funeral misses the point. 1 John is a “letter” about living in a community with Christ. It is very much rooted in this world, and how to live and act as followers of Christ. These are the twin themes of 1 John that matter the most. God is light and God is love. God is light, so we should remain in the light. Remain in the truthful teaching of this particular community. Other communities are focused on the wrong thing, and deny that Jesus is the Christ. God is love, so we should love one another. Remain in relationship with Jesus by loving each other as Jesus loved. Remain in love, so that when he comes, you can be sure of his love. Remaining in the light is of utmost importance, and the way to do that is to love one another. Those who recognize that Jesus is the Christ are called children of God. Those that don’t recognize that are in darkness. Author has little room for gray area - same as Gospel of John. Many dichotomies can be troubling, but also demand response. Right understanding of the nature of Jesus leads to right relationship with God, leads to right relationship with each other. Being a child of God means that you will live a particular way - the way of love. Sin is acting out of motivation that is not of love. “Christian Perfection,” is not about being mistake-free. It is about allowing the love of God to be the motivating factor in all you do. So, are we deceived if we claim to be without sin, or are those who abide in Christ sinless? Tense suggests a habit of sinning. So is it okay to just sin at random times? Some suggest while we are with Christ, it is impossible to sin, but we step out of relationship when we sin. So are we constantly stepping in and out of relationship like a bad boyfriend? The grounding of who we are is in God’s love as revealed through Jesus. Everything we do as a Church and as Christians, must be read through the lens of the love of the Father. This is the only ground on which we can stand. Righteousness then, is living as a reflection of that love. What exactly that will look like is still not known. It has been revealed to us. We have a glimpse of what it is to live in perfect love. That glimpse is Jesus Christ. We are called to do the same, but it has not been fully revealed. As people following Christ though, we are called to live it out as much as possible. We are called to be pure as Christ is pure. We are called to love as Christ loved, to forgive as Christ forgave, to invite as Christ invited. When we cease loving, we are no longer following Christ.